As you can all see the forum is back. Our forum server is still offline, but we have restored the backup to another server. We took the downtime as an opportunity to upgrade it and bring in our new theme that was in development. The theme wasn't completely finished yet, and we haven't extensively tested the new forum software so it might be a bit rough around the edges. If you find any functionality which is missing and we used to have, or anything which is simply not working correctly, please check the list below. If your item is not in the list, feel free to post a reply and I'll add it. Anything which is not about the forum will be removed - lets keep this thread clean! The following is a summary of the bug reports from this and other threads. If you post an issue in this thread, and would like it included in this list, then provide a statement of the problem in 20 words or less. LockOldThreads - Locks threads after a specified time from last post to prevent old threads being resurrected. imgbb mod - to allow image uploading to imgbb and for image link to be placed directly in post. The thread in question is the first one... Donations Wanted!!! The thread becomes illegible after Unapproving, but is still there. Also, when you view the Unapproved post, there is no indication that it is Unapproved. Previously the post would have a pink background. 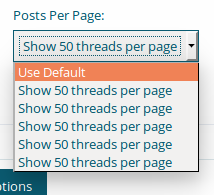 Under "Administrators" listing, is it possible to have a "Forum Moderators" listing. It would make it easier to track who is and is not a Moderator. Also initially posted an image directly into the post using ctrl+v, and created an ascii mess. Selecting a post will blank/blur its 5 action icons in the bottom right, until you hover over them with your mouse cursor. The text color (=light gray) of the timestamp above a posting is making it a bit too hard to read comfortably. Something more darkish gray should help. Fixed. Might take some time to show because of cache. That selection has been mapped to the Search Box. Won't be fixed. Link removed. Needs a plugin. Not sure I want to install it because of only one query that basically does the same as "View New Posts"
Ok, understand. I did always think those two selections were quite similar. Now that you quoted my post, I could barely tell that it was a quote. Is there anyway to add more highlight to the Quote box. That fine grey border is quite easy to miss depending on the view angle.